And of course this hobbling of Orion alternatives to ISS and LEO is what the HR3082 responsible politicians went for, as they need to keep their dearly paying constituents happy. The current Orion already looks like a SST repeat – a vehicle to go everywhere will not go anywhere (without people paying through their nose). And it will be everyone related to ISS/LEO projects that will eventually pay for the inefficiencies and inadequacies, not only US citizens. Feh! It’s no surprise that Senate Republicans killed an earlier version of this bill that would have increased NASA funding. They oppose bills like the START Treaty and funding insurance for catastrophic illnesses incurred by 9/11 first responders. It appears that the future of meaningful space exploration will be the responsibility of commercial ventures. Pity. Really a pity of one man can due to the space program and in general the United States, if he gets his way we’ll be behind every country in this world and we”ll be a bunch of second stringers. I hope a America wakes we should be leading space exploration and have a bold plan to go forward. Folks, you’re not getting the big picture. What’s being played out for us is the interaction of Big League Economic Hardball and The Military-Industrial Global Conglomerate Conspires To Defraud the American People And Nullify International Treaties By Fiat–as a “dog and pony show” for public benefit. Keep your eye on the ball–err, rather the money. Big money. The Helium-3 in the top meter of Moon soil is largely unobtainable on Earth and worth at least several $ trillion because it is vital to make nuclear fusion reactors practical. (NIF at LLNL is going hot with inertial fusion inside 2 years. That’s a virtual done deal. Full commercialization will follow with fusion power to the grid 10-15 years afterward. See current Dr Edward Moses video on YouTube laying it all out…except for the He-3 upgrade he well knows will be necessary, but doesn’t want to discuss yet for obvious reasons.) The minerals obtained as byproducts in strip mining and processing the He-3 will be far, far more in volume and likely tally out to another several $ trillion-minimum. Those minerals and the water ice up there will support colonialization and industrialization in buried Bigelow habitats made possible by the strip mining. Long-term occupation is possible because there is gravity and readily crafted protection from solar radiation. Any and all of the above raw materials have special worth in being beyond the Earth’s gravity well, so as to allow their ready use of anything produced in outer space. Getting heavy loads off the Moon is relatively easy. Industrial refinement and smelting add nothing to Earth atmospheric pollution and Global Warming via “greenhouse gases”. Boosting from Moon orbit to Mars isn’t much of a trick, either. What can be extracted from Mars and its moons is huge in dollar terms and currently incalculable. Very possibly what’s there would rival what mankind has found on Earth in the last 20,000 years. Late 1990’s NASA documents place the value of the minerals in the Main Asteroid Belt at around $600 quintillion! 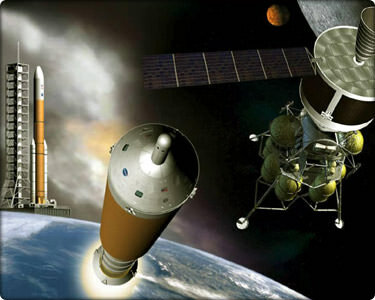 If the US Government, or its proxy, NASA, gets out to that bounty first, there will be quite a squabble over ownership–including problems vis a vis US multinational treaties internationalizing space and forbidding laying national sovereignty claims to celestial bodies. Multinational corporate conglomerates have signed no treaties, but do have the recognized ability on Earth to lay claim to property. If they “happen” to get out there first, who’s going to deny them that same right in space? Minus complications with national sovereignty, corporations are in the unassailable catbird seat. How likely is it that savvy speculators like Musk and Branson and others are going balls out in their private space race to obtain a few ISS space cargo and astronaut taxi contracts, or simply to make chump change giving LEO rides to rich poobahs? Moreover, just as Roscosmos, ESA, JAXA, the Chinese and the Indians are gearing up their space efforts, isn’t it odd that the US/NASA seems to be in default? Look for those extra funds to be appropriated by Congress to help the corporations move fast enough to beat the other national efforts. Look for the USA/NASA to keep floundering around–except for the “secret initiatives” under DARPA and the USAF Space Command, like the X-37B, etc. Then,look for Musk, Branson, Rutan and others to carve up and claim the various celestial assets as private property backed by the US military, which will suddenly uncloak a Space Command Fleet. All that you’re seeing will have been a huge ruse to allow uncomplicated transition to corporate hegemony in space. But, of course, We the People will pay the taxes to maintain security against any “negative elements” objecting to the New Order in and above the wild, blue yonder. That sort of fait accompli is extremely hard to argue against successfully–and to whom as court of appeal? You heard it here first. Any bets that I’m not correct in reading between the lines? Previous PostPrevious Will the Milky Way’s Black Hole Become ‘Hyperactive’?